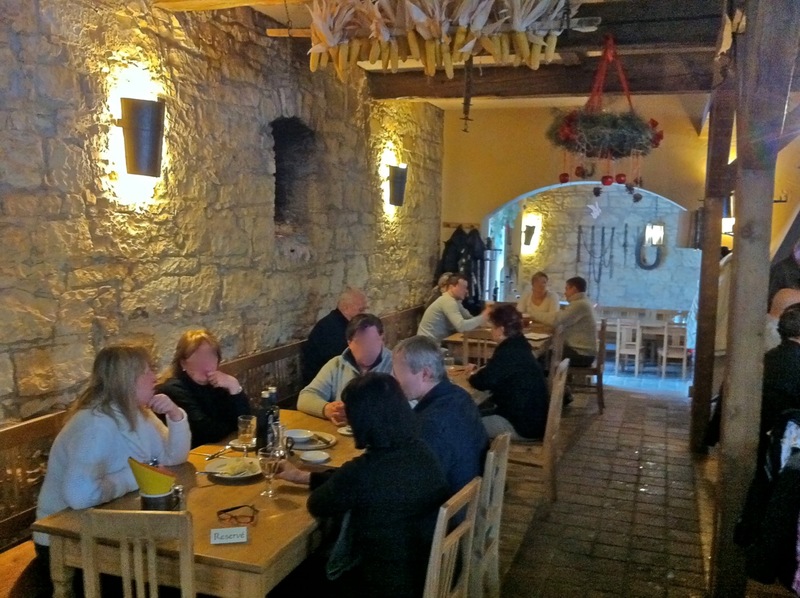 My friends and I gathered at Klášterní šenk for a big group lunch before New Year's Eve. The name Klášterní šenk basically means The Cloister's Tap Room. I'd never been there before, but I'd heard some good things. 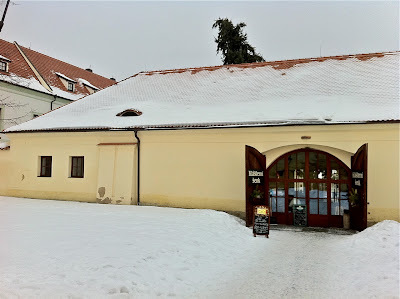 The Czech restaurant is in the middle of the Břevnov Monastery complex. The interior of the restaurant is appropriately rustic, with stone walls and dried corn hanging from the rafters. There's working fireplace in the back. 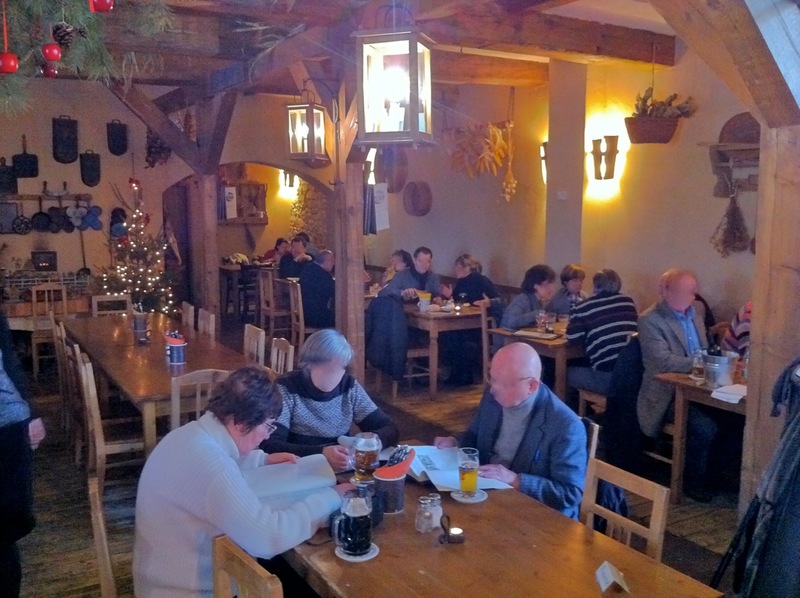 The restaurant is often very busy. Reservations are a good idea. 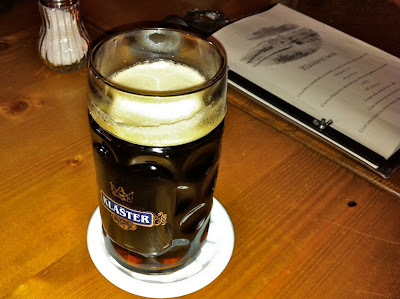 Most come for the food, but there is also good beer. They serve Klášter 11° lager (32 CZK). They have Černá Hora dark beer for the same price. Before the meal, we received round, floury loaves of Czech bread, along with butter and sádlo. 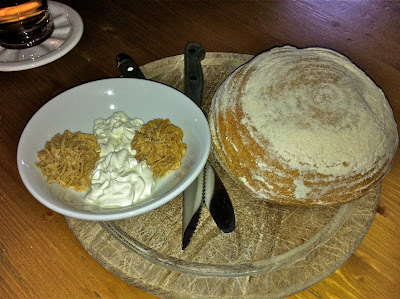 For the uninitiated, it may look like pâté, but sádlo is actually pork fat. The bread was fresh, served cold. 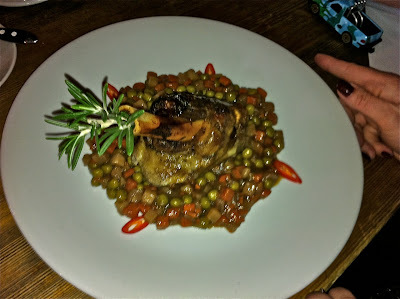 The first dish I got to try was M's lamb shank (330 CZK). It was expensive, but it was very good. The large hunk of meat (300g) was cooked to impressive tenderness. It had rich lamb flavor. It sat on what they called a "vegetable ragout," which was mostly peas and carrots. 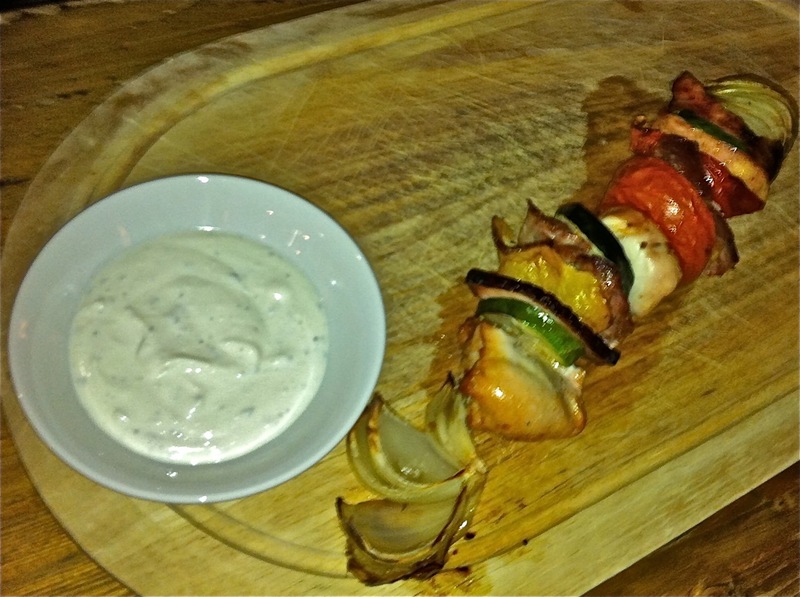 Her husband, Big B, got the meat skewer (260 CZK). It was pork, chicken, and vegetables. I didn't get a bite of this one. The bramborak was very good (189 CZK). 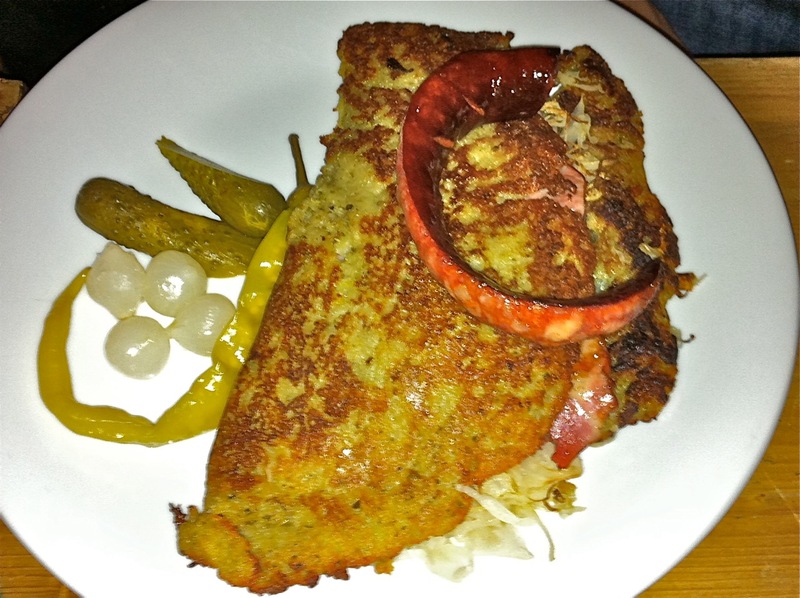 The large, thick potato pancake was filled with smoked pork and sauerkraut. 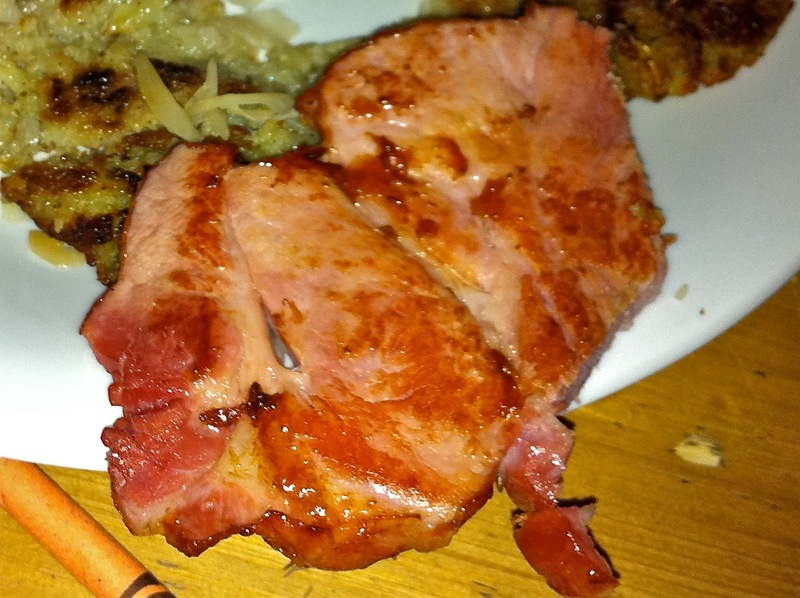 The pork was a cut above in quality from many others I've seen. 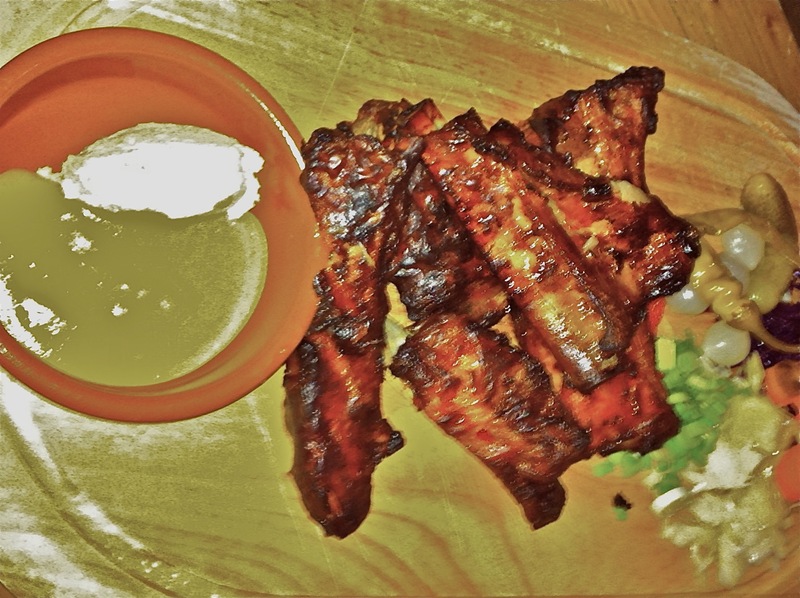 A few people ordered the pork ribs (189 CZK). They were both very meaty, very juicy, and very fatty. There was no smoke flavor. Some liked it, but it wasn't my style. The taste reminded me a lot of koleno, or pork knee. No one ordered that dish at the table, but I saw one going by and it was huge. I made three separate orders to put my lunch together. I had the krkovice or pork neck (139 CZK), red cabbage (35 CZK), and three bramboraky or potato pancakes (35 CZK). I was very pleased with this combo. 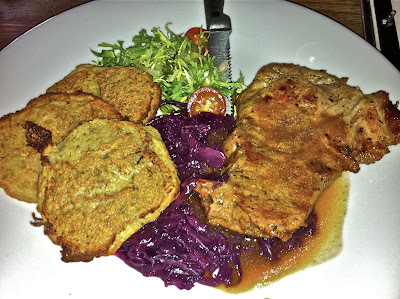 The pork was thick, tender, and full of flavor. I gave Big B a bit and he nodded with approval. The saltiness was balanced by the sweet and sour cabbage. 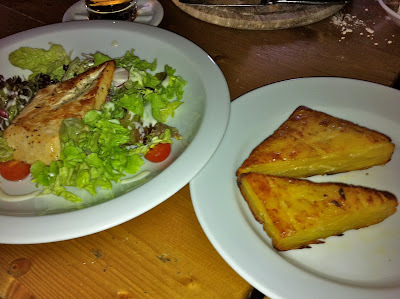 The crunchy, garlicky potato pancakes were small and thin, but held up its end in this trio. 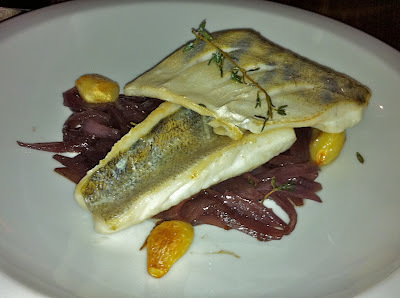 Someone raved about their zander or candát on onion ragout (350 CZK). It would never occur to me to order fish at such a restaurant, but good to know that fish eaters have options. A friend who used to live nearby highly recommended the rabbit. What was not so good? 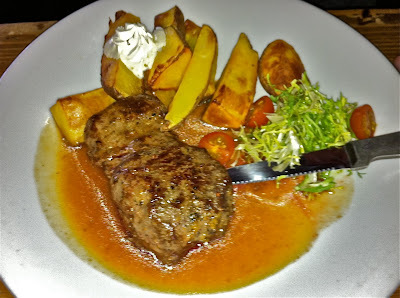 The steak (230 CZK) was just OK, very average Czech beef, I'd say. A salad with chicken looked pretty anemic. Service was generally efficient and business like, with no attitude. 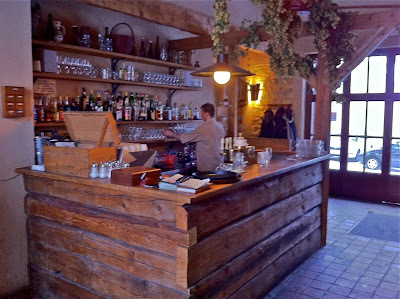 Klášterní šenk is not exactly cheap, and while its offerings are better than average, it's not necessarily a place to go out of your way for. 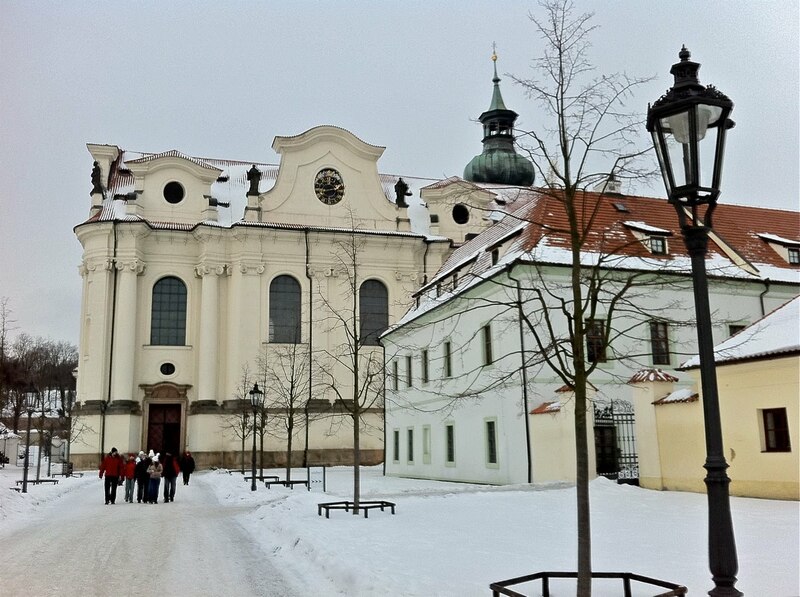 But it right next to the tram 22 line, not terribly far from Prague Castle. 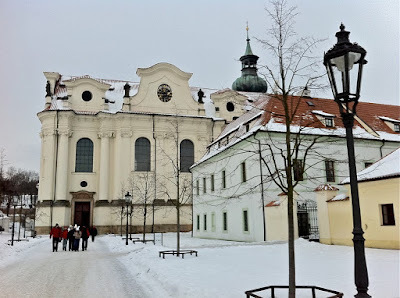 If you are out visiting the beautiful monastery complex, I imagine it is the best place for a meal, especially if they have a fire going in winter. This is perhaps my favourite restaurant in town. Really good value and, IMO, well worth the short trip out there. 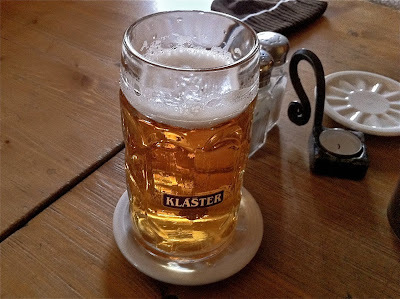 PS; That pale lager is not their own brand, is Klášter 11°, brewed in Mníchovo Hradiště. A pretty good beer, really. Thanks, Max. Someone told me wrong -- I fixed the beer reference in the post. I know.. I shot these fast with my iPhone. I get better results with a Canon point and shoot. Thinking about investing in something better for low light like the Canon S95, but quite expensive. Can't carry around a DSLR. In summer I live behind the monastery grounds so I've been here a lot. I've always had good service but I've heard some say it's not consistent. Mostly I'm just happy if the back gate is open so I can cut through instead of walking around the garden. In the summer they used to have signs on the outdoor tables with a photo of two guys sitting together on one side of the table with a circle and a line through it. At first it looks like a sign meaning "no gays" but really it means don't sit on the same side of the table because the tables aren't strong enough. I have been here a few times. I like the atmosphere, the beers and the food, and this is one of the restaurants in Prague I always return to.